Copyright © 1993, 2005 Aaron Shepard. All rights reserved. 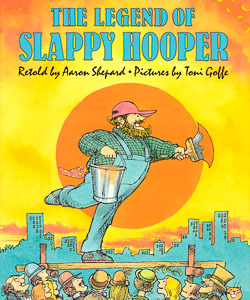 The legend of “Slappy Hooper, World’s Biggest, Fastest, and Bestest Sign Painter” was collected in Chicago in 1938 by Jack Conroy for the Federal Writers’ Project of the Works Progress Administration. It was first published in B. A. Botkin’s A Treasury of American Folklore (Crown, New York, 1944). Legends are built piece by piece, by many hands. Conroy himself presented only a selection of Slappy’s exploits. So, in the storyteller tradition, I’ve included new adventures of the world’s greatest sign painter.